Ragi is suited for cultivation in areas with annual rainfall of 700-1200mm. it does not tolerate heavy rainfall and requires a dry spell at the time of grain ripening. It grows well in altitudes of 1000-2000m with average temperature of 27oC. 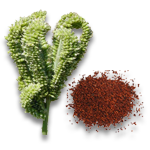 Ragi is cultivated mostly in red lateritic soils. Relatively fertile and well drained soils are the most suitable. 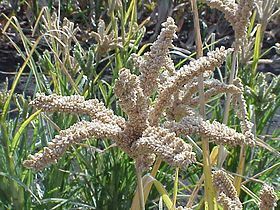 Ragi is not a season bound crop and hence can be cultivated throughout the year, if moisture is available. Prepare the nursery field to fine tilth. Incorporate FYM/ compost 5t/ha and form beds and channels. Sow seeds uniformly on the beds and cover by stirring the soil. Apply carbaryl 10% on the edges of the beds against ants. One week before uprooting seedlings apply ammonium sulphate @ 1kg/ 100m2. A nursery area of 480 m2 is necessary to raise seedlings for one ha. Transplant the seedlings when they are three weeks old. Plough the field 3-4 times and incorporate FYM or compost 5t/ha. Apply N, P2O5 and K2O @ 22.5 kg/ha each before sowing planting. Topdress N at 22.5 kg/ha 21 DAS or planting. Weeding should be done 3 weeks after sowing and completed before topdressing. Irrigate the field on the day of transplanting. Irrigation at weekly intervals increases growth rate and yield. For controlling grass hoppers, spray carbaryl 50% WP @ 1.2 kg/ha. The pink stem borer, which causes dead heart symptoms, is often serious in the early stages of the crop. Insecticidal control is not needed for mild to moderate levels of infestation. For controlling blast, spray mancozeb 750-1000g/ha. Harvest the crop when the ears are yellowish brown. Heap the harvested ears and cover the heaps with ragi straw for 2-3 days before threshing.